I released yesterday the version 3.3.0 of SoundSwitch. The settings window can be resized at will and now provides 2 differents categories of Devices, the one already “active” and the one that are available. The sorting is done when the user will reopen the settings. Each menu item have now an icon to help the user to differentiate each entry. A simple new feature letting the user access the Windows Sound Mixer from SoundSwitch menu. This idea came from the original developer of SoundSwitch, I found a simple way to implements it. 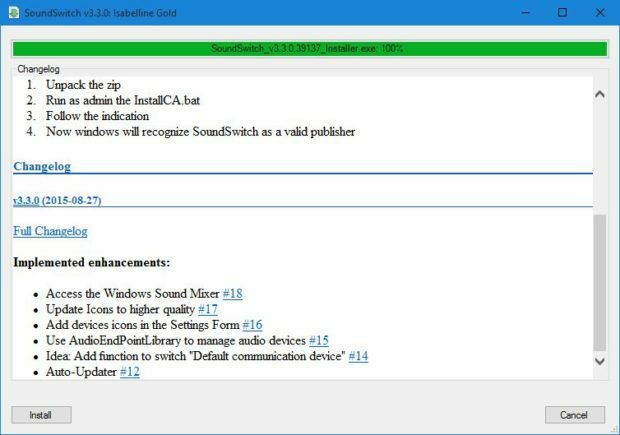 This is one of the interesting feature added in Isabelline Gold, the auto-updater. Every 12h SoundSwitch will check the github repository (thanks to the GitHub API) for a new release, if a new one is available, the user will get a notification and the “No Update” in the context menu will change to “Update Available (X.X.X)” where X.X.X represent the new version number. When the user click on it, a new Window opens with a progress bar (see screenshots). The new version get automatically downloaded in the temp folder of the user. When the download is finished the user can install the Update by just clicking the install button. A changelog is also provided by getting the information set in the release on GitHub. SoundSwitch can also change the communications devices when asked in the Settings. 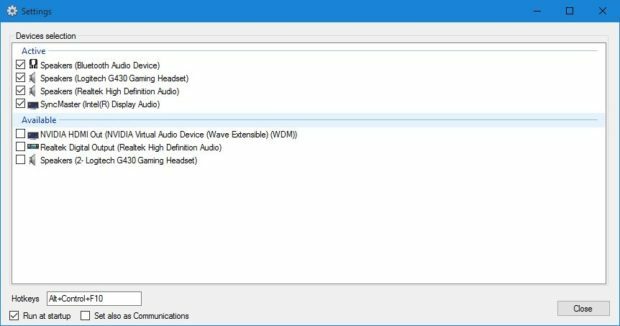 Windows make a differentiation between Multimedia and Communication, it means if an application ask to have access to Communications Audio Device (like Skype), it will receive the default Communications device. By default SoundSwitch only change the Multimedia device, and not the communications. Now if the checkbox is checked in the settings, it will also change the Communications device. A library based on DefSound to provides access to Default Sound Devices. This library is using the code of DefSound to provides access to Default Sound Devices. This library wouldn’t exists without the amazing work of EreTIk. With this, SoundSwitch is able to manage audio device is the cleanest way. This library is easy to maintain and provides all the feature that SoundSwitch needs.